Simplified design and serviceability saves time & money! With dozens of our heavy duty high pressure swivels for choke & kill, mud boost and hydraulic lines in service without any failures, The Subsea Company expands the swivel product line to include cost saving solutions for your Coflex hose swivel requirements. Low cost, short lead times, minimal torque under full system pressure and field serviceability were the primary drivers of our simplified swivel design. Multiple sizes & maximum working pressure ratings from 2,000 to 20,000 PSI are available with standard API flange and hub connections. Periodic field maintenance and testing will extend the useful life of your high pressure swivels. 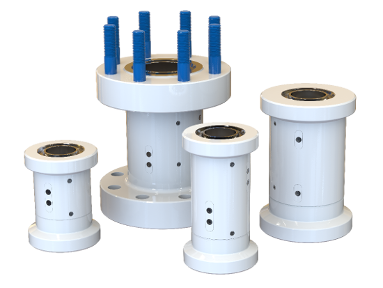 The Subsea Company simplified swivel design includes grease ports to lubricate the ball bearings and raceways and seal leak inspection capability to alert the user of seal degradation.